This application is a 24-5-10 fertilizer with a pre-emergent herbicide included. This fertilizer has a 24% nitrogen which will show visual changes in your turf in 7-10 days. Vertical growth and green up is what will be observed. Also, a pre-emergent herbicide was included which will provide a toxic barrier on the surface of the soil. This barrier will prevent any annual grass weed seedlings. As soon as possible the grass should be irrigated to wash the herbicide into the soil. This barrier will last for 90 days depending on the amount of irrigation or the weather that is experienced. This application is a 24-6-12 fertilizer. Even though the grass plant has slowed its growth due to colder temperatures this application will cause an amount of greening. This fertilizer also provides early greening in the Spring. The other two elements provide a deepening of the roots and an amount of cold tolerance. This application is a 5-10-31 plus iron fertilizer. This fertilizer contains 5% nitrogen which will show minimum vertical growth. With warm temperatures almost here vertical growth puts stress on the turf For that reason we have added P and K. These elements will deepen the roots of your turf, as well as providing heat tolerance and drought resistance. The iron that hasbeen applied will show visual changes, greening up your turf. This application is a 24-6-12 fertilizer. This fertilizer contains 24% Nitrogen. This amount of Nitrogen will help the grass plants vertical , lateral (stolons) and under surface (rhizomes) growth. The other two elements provide root growth for water, heat, and drought tolerance. This application is a 18-24-12 fertilizer. This fertilizer has an 18% Nitrogen content and will provide vertical growth and enhance the green color of your lawn. The other two elements will aid in root growth and allow for some disease resistance. 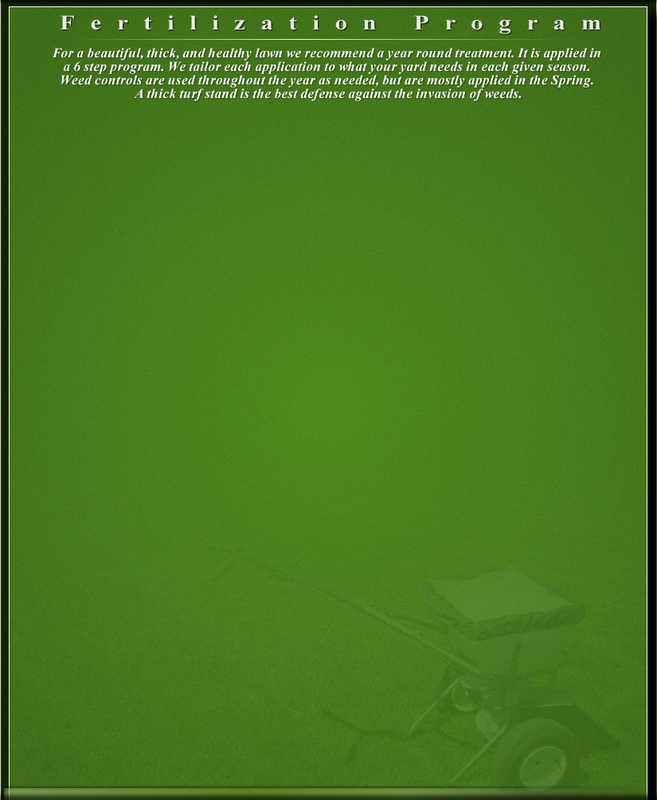 This time of the year is the best opportunity to aerate and seed your lawn. The soil temperatures in the Autumn are optimal for tall fescue. Your lawn should be aerated and seeded to thicken your turf. Aeration provides relief from compaction. The holes that are created allow the water to better penetrate into the root zone. This provides for deeper root growth and will form a healthier more vigorous turf.